Beat egg whites (at room temperature) and salt until foamy on high speed in electric mixer. Add cream of tartar; beat until soft peaks form. Add 1 cup of sugar, 2 tablespoons at a time, beating until stiff peaks form. Sift remaining 1/2 cup sugar and cake flour together. Gently fold sugar/flour mixture into egg whites, scraping down the sides of the bowl, turning over in direction of figure "8". Lightly spoon mixture into an ungreased 10-inch tube pan. Bake at 375ºF for 30-35 minutes. Invert cake onto bottle to completely cool (generally takes 2 hours). 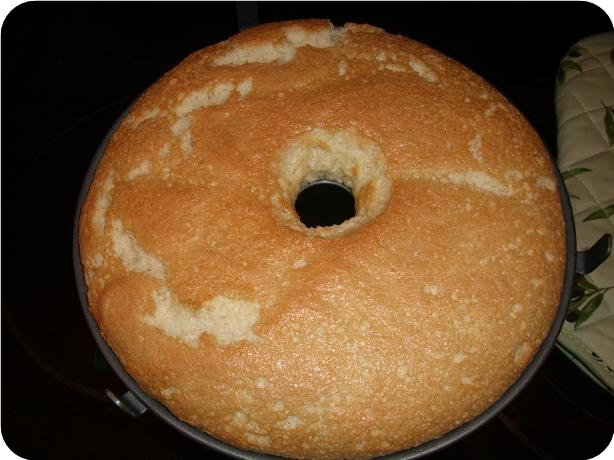 Remove cake from pan by running a sharp knife around the sides and gently pressing on bottom to loosen.